The thoughts of using fasteners, scraps of wood, and finishes left over from other projects soothes me, but even more delightful is the thought of making something that is headed for the landfill live again with a brand new purpose. 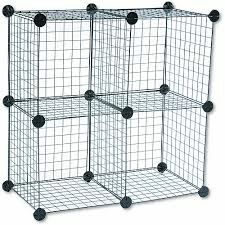 So when I combined a pair of CD towers, some old two by fours, and some casters I salvaged from who knows where, and made my own hardware store, I was delighted. The only thing is, I realized I need more hardware stores. One just isn’t enough. The project pictured has a base large enough keep the “store” from tipping over, small enough to fit through any door, and able to hold tool boxes associated with fasteners. I just drive the store up to a project I am working on, then park it out of the way when finished. P.S., If you have any peanut butter jars you want to get rid of and live near Grand Haven, Michigan, let me know. I save them … as if it wasn’t obvious. Wow that’s tons of storage great job. I have a similar set up-but not on wheels. That’s a good idea. Love that peanut butter! 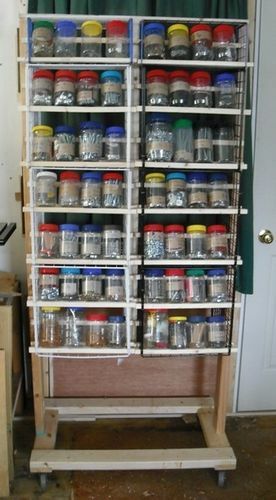 I have saved and sorted nuts, bolts, screws, fasteners etc my whole life and still never have the one I really need at the critical time I need it forcing me to make the dreaded hardware store run. This is a very nice rack but a better solution would be to move right next to a hardware store and talk the owner into giving you your own key for after hour visits. Now thats a great idea and you did it well! Great job! And they said local hardware stores were a vanishing breed. Man, I have been saving peanut butter jars for years, and I use a few of them, but have lacked the motivation to put anything like this togethr. This is AWESOME. You have given me some direction. Thank you. I love organization almost as much as I love creation. -- Todd Adair, Suwanee, Ga.
Nice hardware rack. it is great to be able to find all the fasteners when you need them. I could use one of these but have no more room in my shop. I know I have the screws or nuts, but where are they? ? Here is the new version. 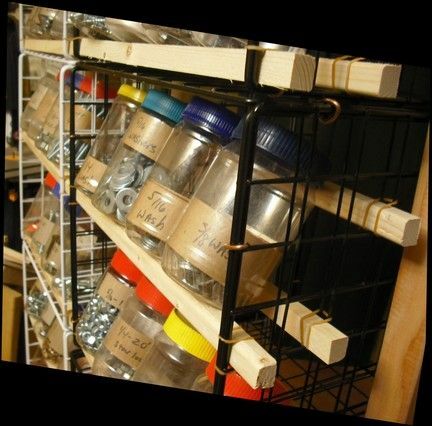 I hesitate to mention the wire racks I collect from second hand stores and yard sales because I want to corner the market and own ALL the peanut butter jars and wire racks in existence in the whole world (hoarder gene speaking here) and don’t want the competition to elevate the price of either. The secret? Hog noses. Fastening with hog nose rings is my new thing. I do need suggestions to replace the rubber bands I used to secure the wooden strips. I know they will break down over time. I need something simple to replace them. The roll away cart holds 112 jars, 56 jars to a side. I keep the most often used on one side and the more obscure units on the back. I hadn’t put the base shelf on the bottom of the cart at the time of the pictures, but with a base shelf, you don’t lose any floor space if you put a tote or other bin on the bottom. It works for me. I hope it is helpful to you. Of course the cart is on wheels. I want wheels on everything … except me. Nice work. It’s a good thing to give new and useful life to something headed for the trash heap. Yes. Helping make something valuable from what others might consider is headed for the trash heap is what drives us, especially if the “something” is a people. Thanks for noticing. Couldn’t embrace your Thoreau quote more. Hi Larry, recycling is cool!! A couple of ideas on the rubber bands-1) use those plastic tie wraps that lock in place as far as you pull them up. They are real cheap at harbor Freight or at flea markets of 2) groove out the boards so the vertical rod fits in it and them put a screw with a big washer in right next to the rod. that will secure it for good. also i heard a good quote about not following the beaten path but go in a new direction and make a path for someone else….......or something like that. I subscribe to that approach with the projects I make! I like the screw and washer idea. 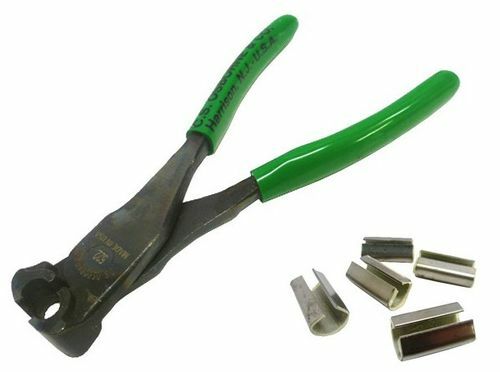 Perhaps I will modify that one to use a large headed brad that I can press into a pre-drilled, slightly smaller hole with pliers set at a wide jaw. You can see the areas I have to get into make it difficult to use tools. The zip strip or plastic tie idea is good too, but it doesn’t bend and wrap around the strip of wood the way the darn rubber band does. When will they discover a material that gives us the benefits of a rubber band that doesn’t crumble with time? 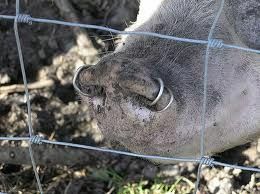 I really do like the pig nose ring and the tool that places it. 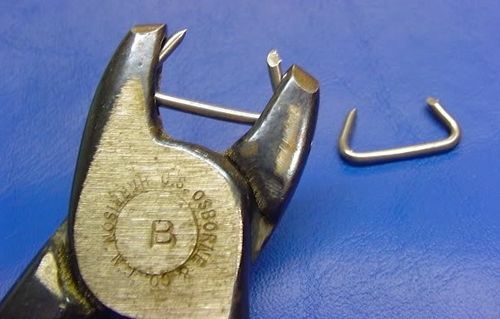 It is similar to the upholstery tool used to clip fabric onto a frame. I am going to be looking at the resale shops and yard sales for some of the tools included here.